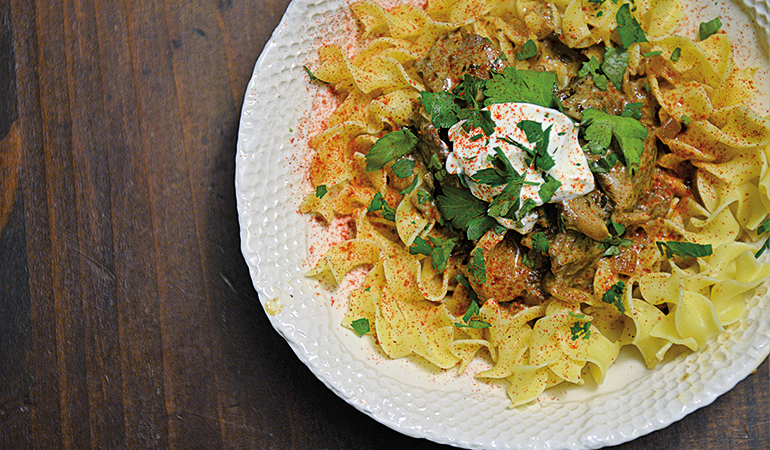 Braised until tender and served over noodles, a hearty plate of moose stroganoff, complete with tangy sour cream, is just one of the many meals the author considers comfort food. Warm your mind, body, and home with a hearty meal this winter. What comes to mind when you hear the words “comfort food”? Is it Mom’s meatloaf? A heaping bowl of mac and cheese? Savory Sunday gravy or a pile of stroganoff over hot, buttered noodles? Or maybe your abuelita’s enmoladas or a rich bulgogi of the kind only a Korean mother can make. No matter the point on the globe, more than any other meal, comfort foods are as personal and individual as our fingerprints, each tied to thoughts of family dinners or perhaps a singular time and place where we sat down to a memorable meal. While we may be able to conjure up our own idea of what we consider comfort foods, defining them is a bit more difficult. Why are those particular foods so tied to our soul and for what reason? Everyone from ethnographers to scientists to psychologists have tried to identify the phenomenon of why certain foods provide us with that feeling of happiness or comfort. They explain it away with ideas of self-medicating depression, overindulging in celebration, or even fitting in to predefined social structures. But really, this is all just overthinking what to eaters is obvious. Consider hunters. For us, food is more than just sustenance; it’s a way to celebrate life and providing for our family what nature offers. Whether or not you’re religious, killing an animal for meat is a monumental thing, and putting that meat on the table is comforting in and of itself. So just what comprises a comfort meal? While a slice of apple pie may summon memories of dear old Ma, I don’t really define it as comforting. In my mind, a comfort food should be savory, not sweet, and overly rich and meaty. But not a steak. I love a flame-kissed slab of meat, but my idea of comfort meals are generally long-simmered affairs. It’s as if the slow cook times and resulting aromas work their way deep into my memory as I anticipate the coming meal. And this makes comfort meals so ideal for wild game. Even though the idea of a comfort food is complex, creating one for your family and friends is generally easy. Because of the typical cooking methods—stewing and braising—they lend themselves to tougher cuts of meat. This is perfect for big-game and bird hunters alike. Cooking under liquid at low temperatures turns the shoulder roast or shank of an old buck into a silky, sauce-filled stew or gravy to be ladled over mashed potatoes. Upland hunters blessed with a tough rooster pheasant can turn the bird into something straight out of Grandma’s kitchen. Simply simmer the gutted bird with the holy triumvirate of carrots, celery, and onions. Strain the liquid, pluck and shred the meat, then return it to the thickened stock. Add egg noodles or fistfuls of biscuit dough for a meal guaranteed to comfort the most troubled soul and, if my grandmother can be believed, the best cure for the common cold. These are just a couple of options for turning wild game into memory-making meals. The options are nearly limitless by simply substituting venison, upland birds, or waterfowl for more domestic fare. I’ve said it before: Meat is meat. And, honestly, most of the comfort meals we enjoy probably originated with hunted game. Consider cacciatore, the original hunter’s meal made up of foraged mushrooms and hunted hares after a successful day in the field. The same goes for choucroute garnie, the famed Alsatian dish of wild pig parts braised in sauerkraut and wine until the meat is so tender it falls off the fork. Something about the season, too, adds to this idea of foods that feed body and soul. Comfort meals are made for colder weather. I have a hard time imagining eating a big meal of meat and potatoes in the summertime, but it’s the perfect antidote when a blizzard rages outside. Maybe it’s the calories and carbs that provide the fuel to keep us warm, or maybe it’s just the idea of heating up the kitchen with a warm oven that makes fall and winter the ideal time to put a Dutch oven to the fire. 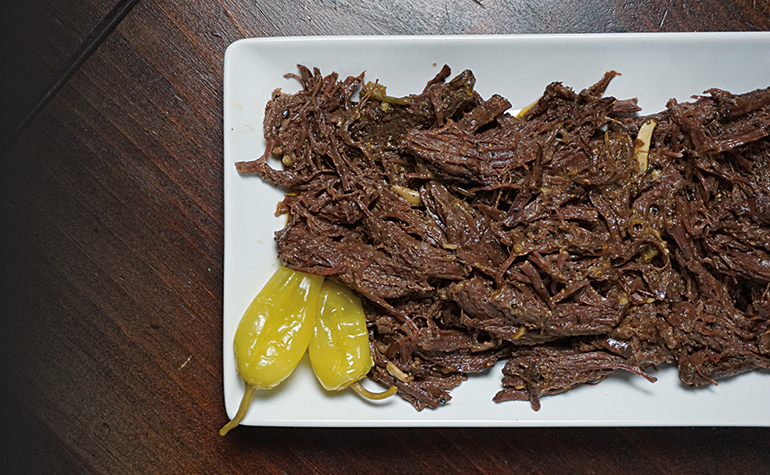 The abundance of pepperoncini and a splash of the pepper’s brine creates a next-level tanginess that works surprisingly well with the richness of roast venison. Season the roast on all sides with kosher salt and black pepper. Dust with flour. Make the ranch dressing by whisking the mayo, brine, dill, and paprika together in a small bowl. Whisk in the buttermilk and let chill for a few minutes to allow the flavors to incorporate. Heat the oil in a Dutch oven set over medium-high heat. When the oil is just smoking, add the roast to the Dutch oven and brown well, about five minutes per side. Pour the ranch dressing over the roast. Cut the butter into eight portions and place them on and around the roast. Add the pepperoncini to the Dutch oven and cover. Transfer the Dutch oven to the preheated oven and cook for 5–6 hours. Turn the roast every hour or so and, if necessary, add a little bit of beef broth if it appears the roast is drying out. After six hours, test the roast for doneness. It should shred easily. Use two forks to pull the roast apart and incorporate the meat with the gravy on the bottom of the Dutch oven. Garnish with fresh pepperoncini and serve.